So the Christmas carol goes. Ever since the days of St. Francis, nativities -- creches, naciamentos, pesebres -- have been a hands-on tool for teaching the Christmas story. Our selection of nativities is a delight to the collector, and culturally fascinating as different countries express the story in different media and with different iconographies. Our Krygystan nativity is made from 100 percent wool, and the yurt is also the storage container for Mary, Jesus, and Joseph. The sheep here is a horned ram, and the characters are dressed in the clothes of Krygystan. 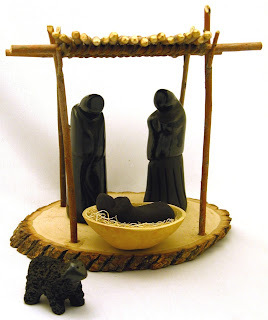 Our painted wooden nativity from El Salvador has magi of extre mely interesting iconography. It's common for Latin American nacimentos to have three kings ("los reyes") representing different ethnic groups, a tradition that started when Europeans began exploring the globe. But these wise men represent different classes of people: an earthly king, a monk, and a worker. Whether the wise men are coming from different countries or from different social positions, the use of them to teach the message of the world-wide reach of the Christmas story is both charming and profound. These two nativities are some of many that we carry that are suitable for children -- fun to play and learn with and unbreakable. Collectors appreciate them, too, but they may also have their eyes on something like our $520 Santa Clara Pueblo nativity, made by ceramic artists Andy and Marcia Padilla. This northern New Mexico pueblo, registered in the National Register of Historic Places, is famous for its blackware pottery, most especially its vases. Here at Crossroads you will find the a rare, elegant rendering of the Christmas story. There are many more: Kenyan nativities of banana fiber with wise men bringing gifts of fish and grain and beer, wooden Russian fixed-based nativities (each member has a peg that fits into the base) painted in a subtle and sophisticated style, and jolly round ceramic figures from Colombia. All contribute to the storytelling that is a wondrous part of Christmas.